Written on 13 July 2015 . On 31.8, within the framework of the 10th conference of the Executive Committee of the World Association of Martial Arts (World Martial Arts Union – WoMAU) in Chungju (South Korea), General Secretary of the World Vovinam Federation Vo Danh Hai was great covers 32 countries and territories attended the election to the position of Vice Chairman of the organization. At the conference, on behalf of the delegation of Vietnam, Mr. Hai has appreciated the efforts of the last WoMAU members in research, conservation, and promotion of traditional martial arts and traditional martial arts festival world annually has been recognized as a UNESCO cultural heritage. 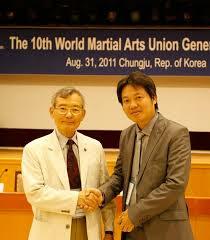 He also reported the results of Vovinam worldwide movement over time. The members congratulated WoMAU the Vovinam will be included in the official competition at the 26th SEA Games – November 2011 after the success at the third Asian Indoor Games time as development, international integration of subjects Traditional martial arts. On this occasion, members of WoMAU was inaugurated WoMAU Office, Museum of traditional martial arts world in the campus park conservation world martial arts of nearly 200ha. Vovinam and traditional martial Vietnam has continuously participated in the forum, introducing promote traditional martial arts festival in the world in the city of Chungju – beginning where traditional martial taekgyoun – later evolved into Taekwondo – from 2000 to present. As planned, the Group Coach, Vietnam Vovinam athletes continue to attend this year’s Festival from 1st to September 8, 2011.